Earlier this week, leaders from all over the nation came together to share their ideas, plans, and best practices for growing sustainable cities. 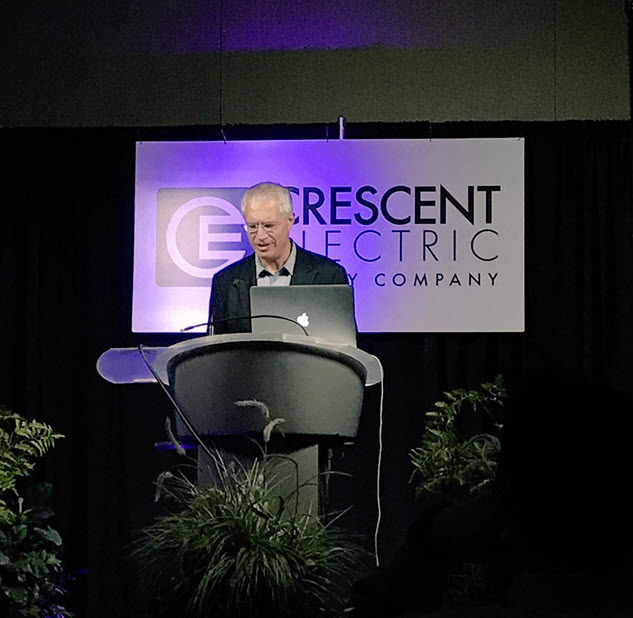 Crescent Electric Supply Company had the opportunity to sponsor this two-day Growing Sustainable Communities Conference that was presented and hosted by Sustainable Dubuque. The event has taken place for the last decade and has helped to bring together government agencies, healthcare professionals, businesses leaders, and educators who understand the significance of their impact on the world we’re living in. Crescent Electric, with our nationwide presence, understands the importance of providing more than just products to our customers. Please enjoy reading some of the highlights from this year’s conference. Majora Carter speaking at the Growing Sustainable Communities Conference in Dubuque, IA. Majora Carter, a leading urban revitalization strategist, real estate developer, and Peabody Award winning broadcaster, shared not only her vision for revitalizing low-income communities, she shared how she has started accomplishing just that. Ms. Carter has created many spaces for people in the South Bronx to unite as well as to learn and be employed. Her approach is methodical with great heart, and her message for the conference was clear: build communities and people up. Gary A. Agron, of Anchorage Municipal Light & Power, presented a major project based in Anchorage, Alaska, where 4,000 LED streetlights were installed for outstanding energy and maintenance savings. Also installed were solid-state controls that allow system monitoring and adjustments from mobile applications via GE's LightGrid system. The system can dim lights and pin-point burned-out LEDs, measure how much electricity is being used, and can be connected to other public agencies in the future. With the intel and flexibility of these lights, Anchorage is able to match the lighting to changing public needs (i.e., specific zoning areas and special events) as well as traffic patterns. To see Gary's presentation slides, click here. Louie Psihoyos speaking at the Growing Sustainable Communities Conference in Dubuque, IA. Louie Psihoyos, an Oscar-winning documentary filmmaker, world-famous still photographer, and executive director of the Oceanic Preservation Society, shared how he uses his talents to spread ideas and motivate conscious change. Mr. Psihoyos spoke about his current film project with James Cameron, in which he is putting the spotlight on issues with the world’s food consumption and documenting the powerful difference that adopting a plant-based diet makes in both the human body and the environment. Crescent Electric would like to extend a sincere thank you for everyone who made this event possible. Curious about how your community can start making a conscious effort to be more sustainable? Contact one of our branches today and connect with our energy solutions experts, application engineers, and project management team.